HM Lord-Lieutenant of Bedfordshire, Helen Nellis, recently appointed her Cadets for 2018/2019 at a ceremony held at Dunstable Community Fire Station by kind permission of Chief Fire Officer Paul Fuller CBE QFSM MStJ DL. Dignitaries present at the ceremony included the High Sheriff of Bedfordshire Julian Polhill, the Deputy Mayor of Luton, the Speaker of Bedford, the Chairman of Central Bedfordshire Council, Chief Fire Officer Paul Fuller CBE QFSM MStJ DL, Deputy Chief Constable Garry Forsyth and the President of St John’s Ambulance Anthony Duggan OBE. Other special guests included the Deputy Chief Executive of East Anglia RFCA Major (Retd) Jane Wilkes, the Chair of the Fire Authority Cllr Paul Downing and Jonathon Bell, a Lord-Lieutenant Cadet from 2013. They were joined at the ceremony by Cadets’ family members. 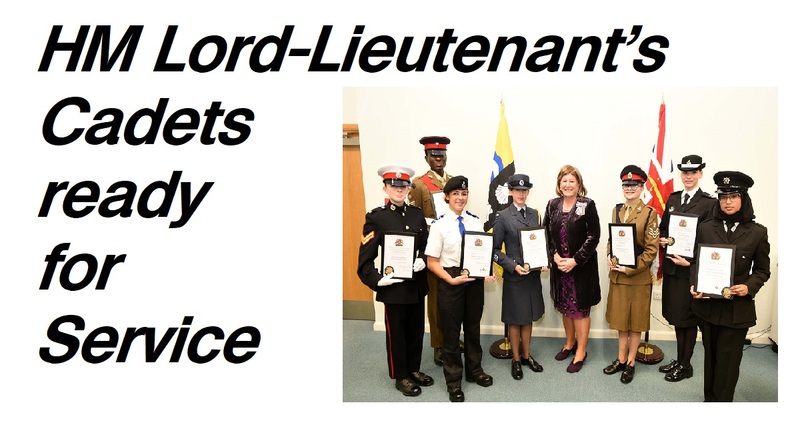 The role of Lord-Lieutenant’s Cadets is to support the Lord-Lieutenant in carrying out her duties and their selection and appointment acknowledge their outstanding contribution to their Cadet service and to the community. The Lord-Lieutenant’s Cadets are the finest of the many talented young people in the Cadet forces within Bedfordshire. They are excellent leaders and a credit to their organisations and to the county. Speaking after the commissioning the Lord-Lieutenant said "It is a great privilege to welcome my new Lord-Lieutenant Cadets to the Lieutenancy Team. They have been chosen because of the high standards they have achieved across a range of activities and, importantly, because of the contribution they make to helping us build strong communities. They are great role models for all of our young people and remind us of what a positive and important part young people play in the well-being of our county."